The consolation here, of course, is that they’re all just beautiful models. Last week, Games Workshop put up a series of seven painting tutorials showing how to pain all 47 of the miniatures contained within this new box, and I was hooked from the start. I love Duncan, of course, because he just makes everything look so damn easy, so I can only hope to match his level of skill when I begin the long task of assembling and painting these things. Of course, I’ve already built up one guy – the free miniature from last week’s White Dwarf. Well, let me take you through the evolution of my guy! I’m very pleased, I must say. I’m actually toying with the idea of using transfers for the first time ever, though I’m not entirely sure just now. We’ll see what tomorrow brings. While I’m a little sad that I haven’t yet had a chance to use the new gold paints, I’m sure I can find a use for them later. The Lions of Sigmar scheme was very easy to follow, I must say – I pretty much did exactly what the caption in White Dwarf says – Balthasar Gold, Agrax Earthshade, and Golden Griffon; Naggaroth Night, Xereus Purple and Genestealer Purple. The green for the warhammer grip was just a personal twist, I suppose. Given that there are so many Liberators to paint, though, I think having a simple scheme will be really useful. I’ve not had a massive read-through of the literature yet, as I’ve been working on the Liberator all day, but you can read some of my thoughts in last week’s blog here. Overall, I’m excited for where they’re going to take the world, especially now that we have the first campaign book confirmed. I’m hoping there’ll be a lot of interesting models coming out over the coming months – though obviously, not so many as I end up destitute! But no! The book in with the starter set actually has suggestions for different schemes, however. Bah! At any rate, I’m pleased with how my Liberator turned out. I’m pleased with how the new models look. I’m excited to see what’s next on the horizon as far as releases go. 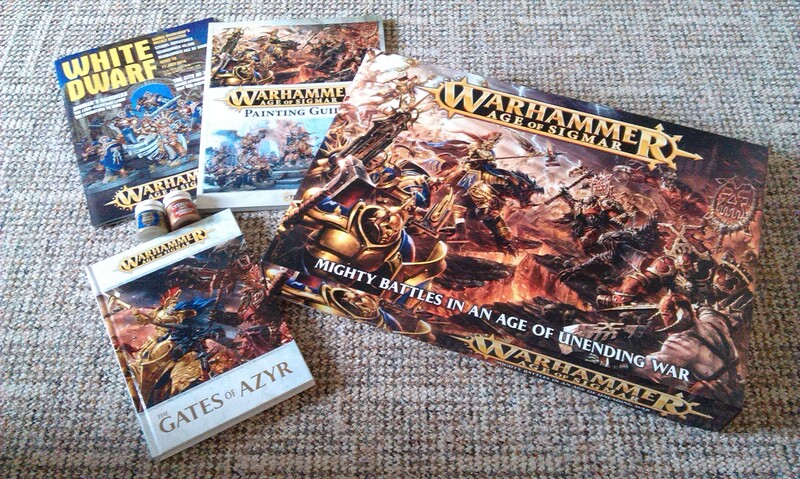 But more than anything, I’m actually excited for Warhammer Fantasy, which I haven’t been for nearly a year. Overall, it was a good day! That model you painted up is very nicely done, Kudos! I’ve never really gotten heavily into the Warhammer series outside of the fluff, Games Workshop’s business decisions put me off from buying their minis. Really interested in their re-work of Fantasy though, totally different direction, I hope it proves to be a success. Thank you! I’m pleased with it – just need to do the rest of the set, now! GW have some beautiful minis, and while I can appreciate the sentiment, I still think they’re well worth checking out for their amazing quality. But sometimes I think I have more money than sense… At any rate, I’m also really interested in where things are going from here! 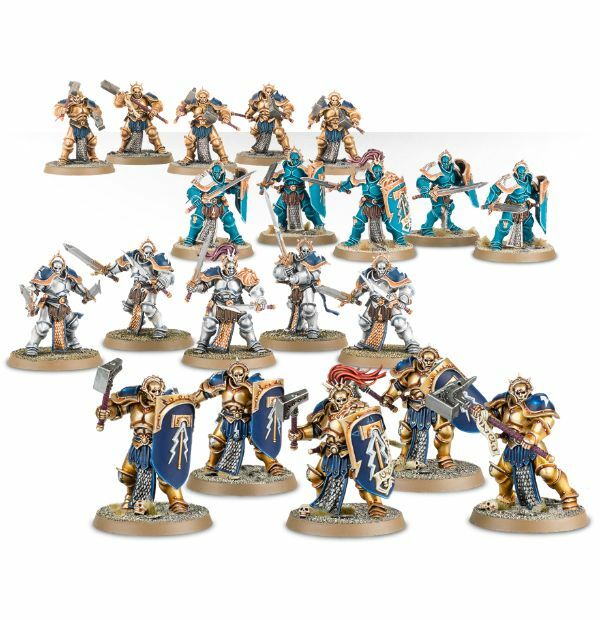 I can’t argue with their quality, I have bought a number of their minis, but no where near enough to be a full army, it has been along while though. Recently I have started a budget wargaming project for WW2 infantry in 1/72 scale. Quite a few manufacturers will get you 50 soldiers for around $15, so many soldiers, so little money. I picked up AoS too – I’ve built a few of the Stormcast and have started to paint them up. I really like your painted miniature. I like the silver look… but i can’t say no to all this gold. So gold it is. Thank you! I think the silver look is really great, but having painted so many Necrons in silver, I feel like I really need the change of colour scheme! 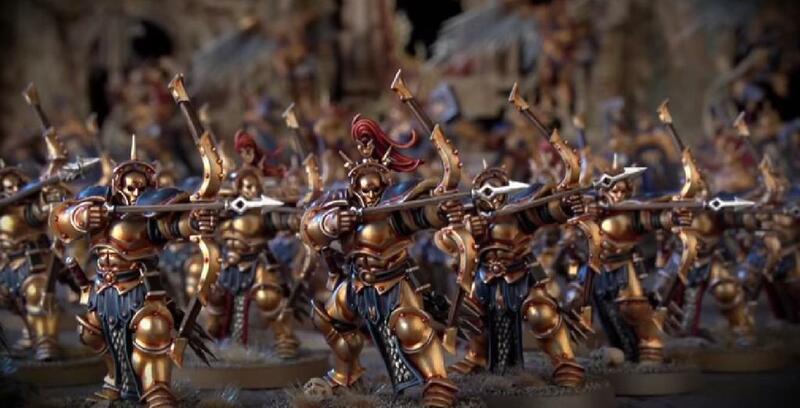 That turquoise one looks interesting as well, I’ve been wondering if I could make up a sort of orphan squad for guys from different warbands, maybe. For now, I’ve built up four more of the Liberators to start work on soon! You’ll have to share pictures of your army!